And here you see the drawing of today of Kata from Hungary. It represents 1 of the 10 proverbs of this video. By the end of the lesson, I show you the drawing again. Your task to guess which proverb it is. Let’s start with lesson 17, containing proverbs 161-170. The word “vuil” means dirty. But the meaning of the diminutive is not a dirty piece, but rather a speck of dust. So, there is no speck of dust in the air. The expression identifies a situation in which everything is ok, and there are no threads. Often it is used, to tell about a moment in the past, when it was not possible to foresee an approaching misfortune. For example, the company was making a profit. Last Christmas the employees received a large bonus. “Er was geen vuiltje aan de lucht”. But then, in January a new player entered the market aggressively. The company lost their market share and went bankrupt. Literally: to eat from two shores. The expression is used when someone tries to get the benefits from two sides or groups. It is not used in a positive sense. Instead of choosing one side, this type of person jumps from one to the other, on the moments that there is some benefit at the other side. The expression’s origin is a cow, which is standing in a ditch, so he can eat from both the shores. Literally: to carry water to the sea. The meaning is to do work that is absolutely useless. Literally: where is a desire, there is a road. In other words, if you really want something, there is always a way to achieve it. Literally: to take something with a pinch of salt. The same as in English, although I think in American English “grain of salt” is used. The expression is used when you should not believe a story entirely. Literally: one swallow does not make a summer. This is also an expression that exists in English. You use it when there is a positive sign, but it is not necessarily indicating a trend. Literally: Joost may know it. The meaning is: I don’t know. “Joost” is a male Dutch name. However, it is actually not referring to some Dutch guy. Joost comes from Joos, which was the name of a Chinese god in Java (in Indonesia which was part of the Netherlands). Now for the Dutch the meaning of Joos was devil. Because this God was not their own God, so they made the God Joos synonym for devil. So Joost may know it, is actually, the devil may know it. Literally: to hear the thunder in Cologne. You use the expression to say someone is extremely surprised after he was told something. Cologne is quite far from the Dutch border. I checked it in Google maps – approximately 60 kilometres. So normally, you would never be able to hear the thunder from that distance. So it would be extremely surprising in case you would. Literally: you have to read the coffee grounds. The meaning: it is difficult to predict. And the origin of this expression is what is called tasseography, a fortune telling method. After drinking a cup of Turkish coffee, there is some muddy residue left at the bottom. Some believe they can read the future from these coffee grounds. Literally: the bullet is through the church. The meaning of this expression is: the decision has been made. It is believed the origin of this expression is that fact that churches during a war usually were not a target. However, when the enemy would start shooting on a church, it indicated the end of any compromise. Likely it the origin is a specific case: a church in the Dutch city Haarlem was hit during the war with Spain in 1573. This bullet you can still see there. Although the origin of the expression is sad, nowadays it has no negative meaning at all. It you really want to finish this course, there is a road. Studying Dutch proverbs is not carrying water to the sea. 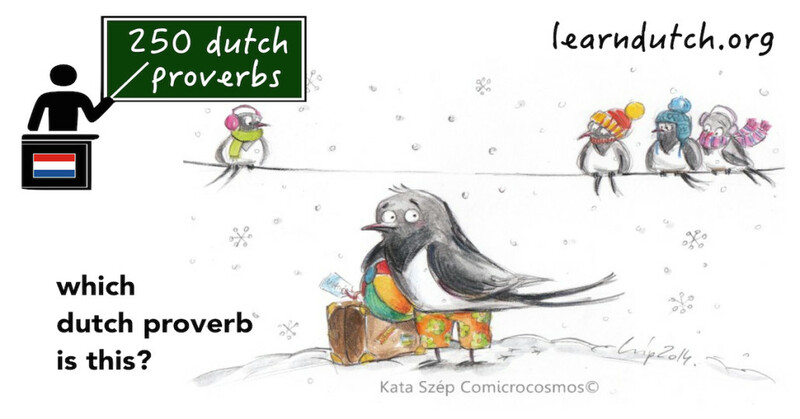 See you back in lesson 18 of 250 Dutch Proverbs.